Y Lariat Necklace Handcrafted in 14k Gold Filled 26g wire and 23 carats of 3x4mm Ruby faceted rondelle beads. Each rondelle Ruby bead weighs an average of .50 carats. All findings, including the 6mm CZ connector component, are created in 14k Gold Filled metals. 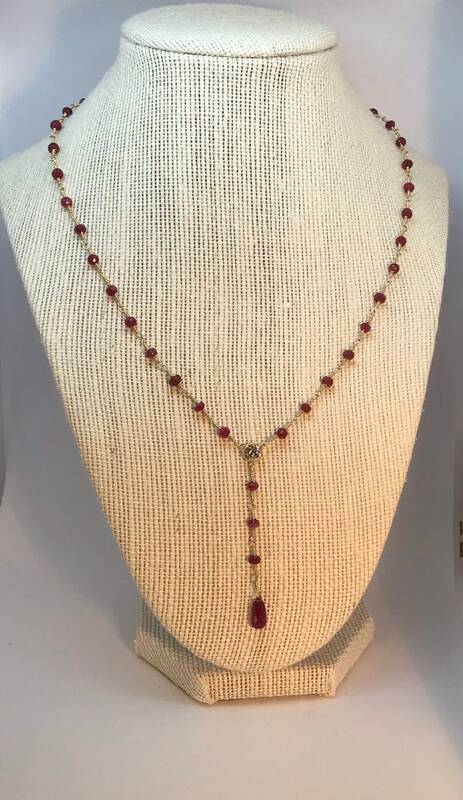 This 18 inch necklace is stunning with a 2-1/8 inch drop from the 3-loop connector ending with a 10mm long transparent 3 carat Briolette Ruby bead. The necklace also includes a 2 inch extension chain for a more dramatic look with your deeper necklines.